North Korea has conducted missile tests every week since President Moon Jae-in came to power here on May 10. 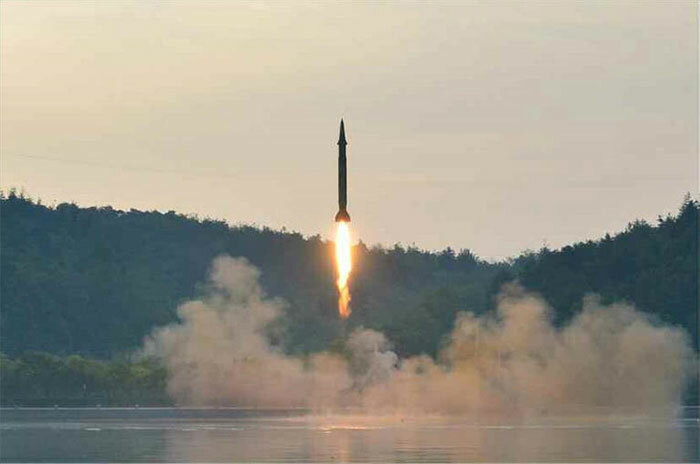 On May 14, the North launched a Hwasong-12, which it claims is capable of reaching the U.S. state of Alaska. On May 21, it launched a Pukguksong-2, which can hit any target in Japan, and on Monday it fired a new missile capable of both surface-to-surface and surface-to-ship attacks. It also tested a surface-to-air missile last Saturday. The message seems to be that the North is determined to carry on developing missiles, with the aim of eventually mounting nuclear warheads on them, and is undeterred by international sanctions, offers of rapprochement, or military threats. The New York Times on Monday said North Korea is getting close to completing an intercontinental ballistic missile while the U.S. is running out of time to deal with this problem. "Even more worrisome is that these missiles actually seem to be functional, unlike older missiles that kept exploding or falling prematurely into the sea in past tests. Recent major tests were clearly successful, teaching the North Koreans a lot about how to fire missiles into space and drop warheads on distant targets," the daily said. North Korean state media claimed Tuesday that the missile that was launched from Wonsan, Kangwon Province the previous day and flew 450 km was a "new ballistic rocket capable of delivering precision strikes on random targets both on land and in the ocean, including enemy warships." It seems to have been a modified Scud ER with a range of 1,000 km and apparently boasts greater accuracy by adding canards, booster rockets and fiber-optic and GPS equipment. It could make Cheong Wa Dae, the Defense Ministry and other key South Korean installations as well as U.S. aircraft carriers targets of precision strikes. A Scud-type ballistic missile is being fired in this picture from the North Korea's official Rodong Sinmun daily on Tuesday. The Moon administration tends toward the Sunshine Policy of rapprochement with the North espoused by former President Kim Dae-jung and has been trying to extend an olive branch, but the North simply slapped it away. Kim Dong-yub at Kyungnam University said, "North Korea's successive missile launches shows it wants to stick to its missile roadmap." The missile development program has drastically gained speed recently. One diplomatic source said, "Through its weekly missile launches, North Korea is showing off its capability to hit targets anywhere in Japan, where American troops would converge before landing in South Korea in the event of war. It's also sending a warning that it can strike targets in the U.S."
The Hwasong-12 and Pukguksong-2, which were launched earlier this month, can both reach Guam and U.S. military installations in Japan. Those bases are also converging points for advance U.S. troops, fighter planes and warships in the event of war on the Korean Peninsula. With the launch of the Scud-type ballistic missile, the North may have been checking whether it is capable of striking major installations in South Korea that would serve as key entry points for U.S. troops in an emergency, as well as nuclear-powered aircraft carriers and submarines. The U.S. and South Korea have been stunned by North Korea's claim that the new missile hit its target with a margin of error of just 7 m. This is a drastic improvement in accuracy compared to existing Scud missiles. North Korea may be exaggerating, but there is a strong chance that the missile's accuracy has significantly improved. One military source said, "Until now, our strategy was formulated on the assumption that North Korea's missiles were incapable of precision strikes on Cheong Wa Dae, the Defense Ministry and other key military command centers. Now, we are vulnerable."